For many of us who follow politics and are concerned about our future, the constant barrage of bad news from Washington, D.C. can become overwhelming and depressing. We know a better world, a better society, a better government is possible yet our leaders continue to fail us. Sometimes, taking a step back and clearing your head from the political circus is the best thing you can do for yourself. 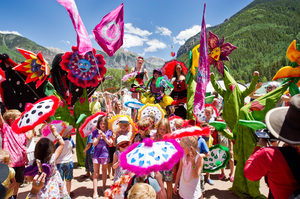 It’s summer and thousands of people are doing just that, gathering at festivals across the country to camp, be in nature, dance, wear their most colorful garb, enjoy art, music and experience a different kind of community. This needed escape is not only a place to party, heal, and recharge, it is an environment that models the kind of community that we all know is possible. A cooperative instead of competitive environment where people enjoy the best aspects of art and culture to experience and envision a glimpse of our potential as a society. Let’s take a journey through a few diverse realms of festival life in America today and consider the ways that these gatherings are shaping our culture for the better. The festival phenomena is not without precedent. Cultures around the world have been gathering in celebration of life, the changing seasons, the planting and harvesting since the beginning of time. It is only in our modern world, where people have been convinced that anything worth having can be purchased, that we have forgotten the importance of creating our own sense of meaning, community, and personal/collective expression. Expression is something much different than consumption as it creates personal renewal from the empowered feeling that one can give back to rather than only take from the world around them. Great festivals encourage this reciprocity from their patrons and this is a powerful way to shape culture without waiting for politicians. Unlike a sporting event with a defined winner and loser, festivals create a collective “win” for everyone who participates. Going back through the decades we have Newport Jazz and Newport Folk Festivals, Mardi Gras, rodeos, and pow-wows, but things get real interesting after the cultural renaissance of the 60’s. 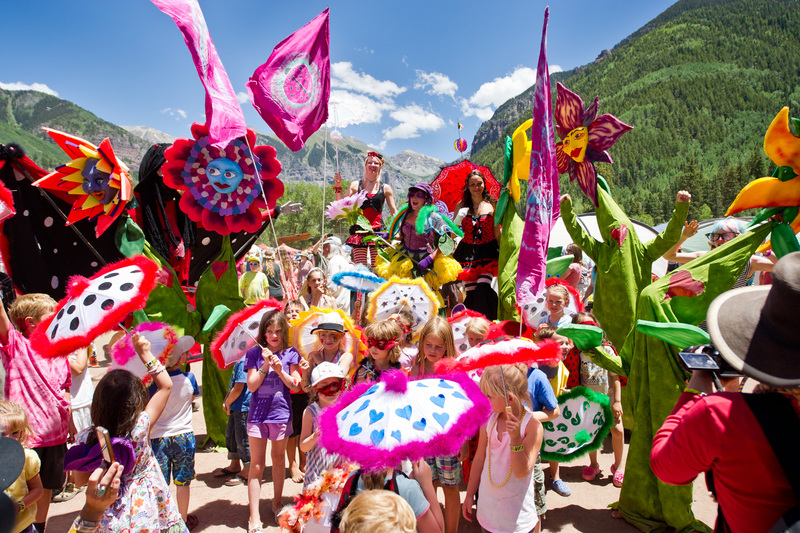 Let’s look at some events that combine the old and new world expressions of festivals from Rainbow Gatherings and Woodstock to Burning Man. According to Wikipedia, “Rainbow Gatherings and the Rainbow Family are an expression of a Utopian impulse, combined with bohemianism, hipster and hippie culture, with roots clearly traceable to the counterculture of the 1960s.” Thousands of people come together to observe their First Amendment Rights to gather peacefully on public lands in a primitive “city” that is carried in and out of the wilderness by foot. It is no surprise that Hopi Elder David Monogye, visited a Rainbow Gathering in 1977 near Truth or Consequences, New Mexico riding in on a donkey to address the gathering. He spoke of “The Hopi Life Plan” and the prophecies that tell of people coming together from all walks, all religions, all cultures and all colors of the rainbow to restore and heal the hoop of life on earth. Monongye was almost 100 years old when he spoke at The Rainbow Gathering and this exchange merged Hopi cosmology, which is one of the oldest living cultures in North America, with a modern emergent form of expression. Hopi to Hippie. The New Orleans Jazz and Heritage Festival is perhaps the grandaddy of American music festivals. Started in 1970 as a celebration to the music and culture that defines America’s melting pot of cultures. In America’s City of Dreams along The Mississippi River, Gospel, Soul, Blues, Zydeco, Jazz, Funk, Rock, Tribal music along with the best Creole and Cajun food you have ever eaten make this event unforgettable each spring. Now in its 44th year, the event has perfected the art of cultural cross-pollination, as jazz and blues were born of the merging cultural expressions between settlers, indians, and slaves in the deep south. 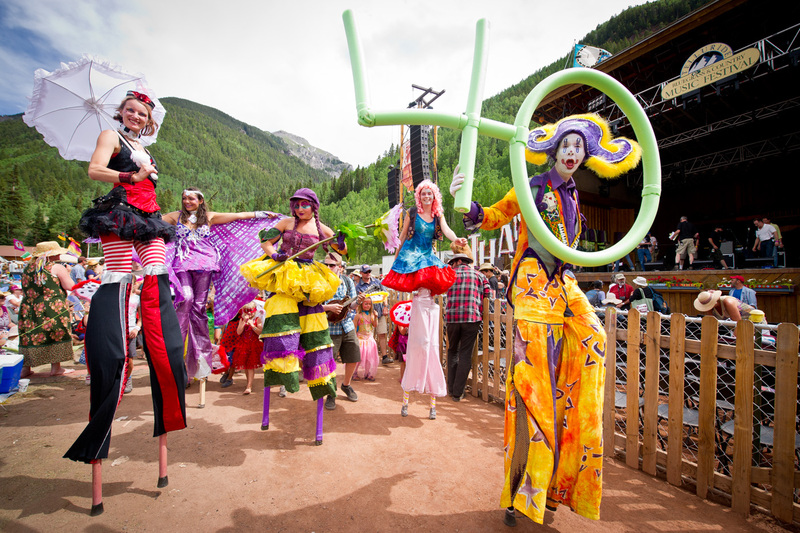 The Telluride Bluegrass Festival just celebrated its 40th year in one of the worlds most beautiful mountain valleys in Colorado. Giant waterfalls, 14,000-foot peaks, aspens, and red rocks are a visual delight to compliment the world-class musical acts. The festival also boasts one of the oldest sustainability initiatives with compostable eating utensils, cups, carbon offset for travelers and more it has set an example for other festivals to strive to reduce their footprint on the environment. With a diverse musical lineup that celebrates the many influences of acoustic, folk, country, rock, and bluegrass, this event is an amazing celebration of the roots of American Music. This year the festival hosted The Drepung Monks with a sand mandala of healing and Tibetan music on Sunday morning creating a cross-cultural delight for everyone present. Telluride, besides being a ski destination has become a summer festival town with a world-class Jazz Festival, a Blues and Brews Festival, a Film Festival, a Mushroom Festival, a Yoga Festival, and more. Locals, tired of having every summer weekend booked with festivals, requested a permit for a “no festival” weekend to get some space from tourists which was accepted by the city council and The Nothing Festival was born. California, the birthplace of The Grateful Dead, has a long tradition of music festival culture and one of the most innovative contemporary manifestations of this community can be seen at The High Sierra Music Festival in the Town of Quincy. Three stages, two late-night stages, a kids stage (that featured Vince Herman from Leftover Salmon this year) with a world-class kids/family area, an open meadow for yoga, juggling, frisbee, silent disco and fire-shows, camping in the pines, and colorful samba parades with giant puppets, stilt walkers, and costumed festival patrons. The Rockin Nannies will babysit your kids at night, Clean Vibes heads up the recycling and sustainability effort and the musical selection is hard to describe. This year Robert Plant of Led Zeppelin, Emancipator, Sarah Jarosz, Thievery Corporation were a few of the diverse acts that covered classic rock, folk, bluegrass, electronic, funk and more. Artist workshops are always exciting, as musicians from different bands come together to play and share stories of inspiration and musical roots in an informal “workshop” environment. The seeds of The Woodstock Nation have sprouted across the country, and their effects are experienced every weekend from sea to shining sea across our great country. Burning Man has inspired a whole new cultural expression and many festivals have sprouted up in its image. If you ever wondered what it would look like if Rainbow Gatherings and Burning man had a baby, visit Lucidity Festival in California. Lightning in a Bottle, Symbiosis, Rootwire, Coachella, Electric Forest, Bonnaroo, The Fareieworlds Festival, and too many to name are now redefining what an immersive festival environment is. In order to keep up with all the emergent festival culture, The Bloom Series has captured the attention of an international audience through their documentary web-series that focus on electronic music festivals that they call “Transformational Festivals”. Bringing the concept of a “gifting economy” to the mainstream, the episodes are available for free with an option to donate to support the vision. The high production value of the series is due to a skilled team with the grounded intention and professional experience of using the power of media to shape culture. Take a moment and watch the second episode of The Bloom Series entitled, Practicing The New World here. I know I have left out so many wonderful festivals and perhaps a follow-up is in order. Regardless of your musical taste, it is clear to see that these independently produced events (and media) have a rootsy expression of culture that is missing in corporate America. They provide a sense of belonging, of community, and expression that is priceless. Festival season is in full bloom and I encourage you to make an adventure to one in your region at least once this summer. Don’t forget to bring your most colorful outfit, some suntan lotion, and a re-usable water-bottle so that you don’t have to use throw-away plastic bottles! I have always loved the saying, “If the people lead, the leaders will follow”. Perhaps our political leaders are too far gone with back room dealings and money-lined pockets from corporate interests to ever live up to the oaths they are sworn to uphold as public servants. Perhaps we must continue to cultivate hope outside of political institutions and define our communities without them. Or maybe we should make it mandatory for politicians to go camping for a weekend, dance under the stars, and sleep under the moon before writing any more laws or making any more deals that effect our collective future. Visualize!